Happy Tuesday! Remember last week when I mentioned I had a surprise for all of you if you voted for me in the OnlineShoes styling contest? (Please still vote! I’m loosing!!!) Well, here is your surprise! My friend and sponsor Sabrina from LouLou Sucre is giving one lucky The Girl in the Red Shoes reader a super cute monogrammed necklace!!!! 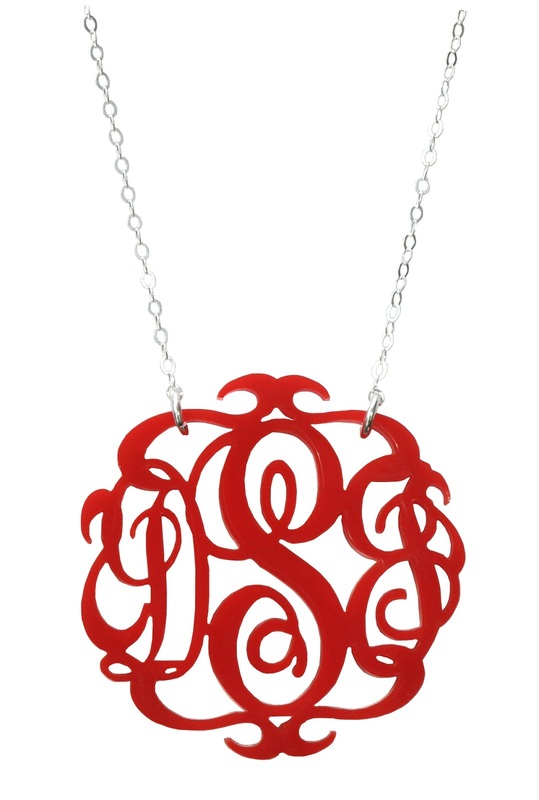 or the Acrylic Block Monogram Necklace. Aren’t they amazing???? The winner will also get to choose their monogram, style, color, and chain color. I’m official jealous of you! This necklace will be the perfect accessory for the summer! I love those monogram necklaces. I like the one that is more script.. and RED of course! Such a fun giveaway!And you are absolutely right – these are the perfect summer accessory =)I could definitely see myself wearing the tortoise in the block. Good luck with the contest! The blue is so different. Would love the script in turquoise! IF IT IS NOT MOVING MONOGRAM IT! –Reese Witherspoon (and me)! I want a metal script monogram necklace so bad!! I'm dying for one of these! I love the block script and the tortoiseshell brown! I have been seeing these everywhere and they are so super cute! I love the script monogram in neon pink! I would love the block monogram in blonde tortoise! Love these! I like the acrylic rimmed script monogram necklace in Navy. I need the acrylic block monogram in tortoiseshell! Love. I have wanted one of these monogrammed necklaces FOREVER. How nice would it be to win one! I would pick the block monogram! Love it! I think I would choose Emerald or Turquoise!! Acrylic monogram necklace in Script I love the Emerald and the Tigers Eye. I love the Robins egg Block necklace! I want the acrylic block monogram necklace in blonde tortoise!!! LOVE! I have been swooning over monogram necklaces and I have to get one!!!! They are so beautiful! I would pick the script monogram in Crystal and silver! I love the acrylic block monogram necklace! I would get it in gunmetal. I am eyeing the antique gold!! So so pretty!! I love these necklaces! My fave is the script in a shade of pink! I love the block one! Maybe in navy or gold!! lol too many choices!! Love the tortoise shell block monogram! I LOVE the red script one! SO gorgeous. Love the tortoise shell block monogram. This has been on my wishlist forever. I'd take the script in either turquoise,black or pink! Awesome giveaway Julie! Love the necklace! 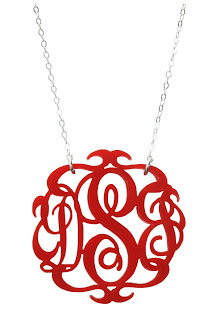 I love the script monogram necklaces…the metal is gorgeous! The collette necklace is awesome too! SO hard to pick a color – love them all! I love the turquoise script!!! I have such a THING about monograms! I'd love the block in emerald. So classy! Love, love, love! Red or white script, please. love the tortoise one! so chic….and would go good with a sweater or with a v-neck tee…please-pick-me-random-computer-drawing-giveaway-machine-thing! I'd pick the script in violet! Love the black so I can wear it with everything! 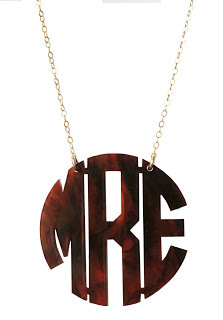 I would love to win the acrylic block monogram necklace in tortoise with a gold chain. I love the block monogram in turquoise! I really love the acrylic block monogram in tortoise! Love these! I have had my eye on one for awhile now!! I would choose the block monogram in tortise! I would love to have the script necklace in gunmetal! i love the acrylic block monogram necklace in tortoise! !